THE GLASS SLIPPER will be performed in the Commedia dell’Arte style, a humorous style of theater that originated in Italy around the 16th century, when traveling troupes performed on temporary open-air stages in city streets and courtyards. 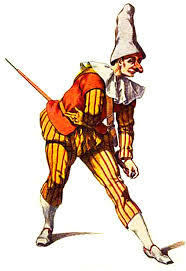 Historically, commedia dell’Arte drew upon the improvisational skills of professional actors, who incorporated bold costume elements and props to perfect a specific role—usually a recognizable social type or stock character, such as the foolish old man, the devious servant, or the brash soldier. While the story lines were standard, typically involving the struggles of young lovers or the comeuppance of a dimwitted authority figure, the actors improvised upon this basic plot, tailoring their performances to individual audiences with sly political commentary or bawdy innuendo. The only scripted parts were the zany comic relief interludes–essentially well-rehearsed mayhem. With The Glass Slipper’s running time of just over one hour, this means ERHS actors and audiences can expect big fun packed into a small show.